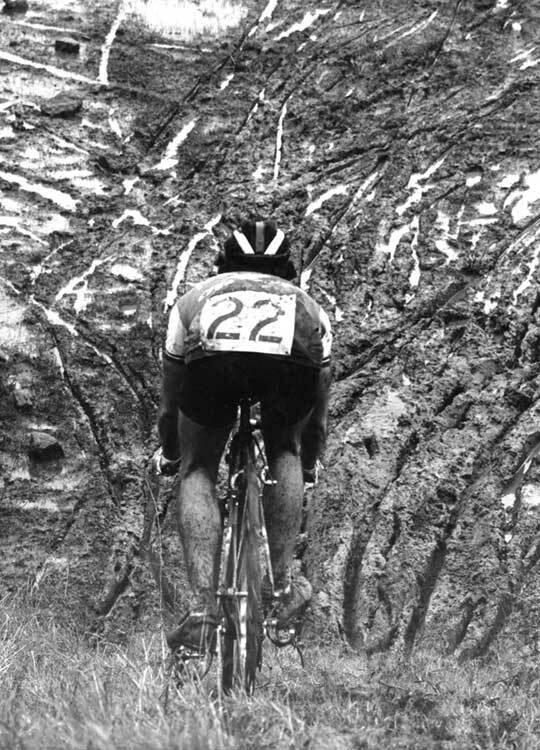 For current Northern California cyclocross racing news and schedules visit Central Coast Cyclocross (CCCX) and NCNCA CX. For national and worldwide coverage, visit CX Magazine. 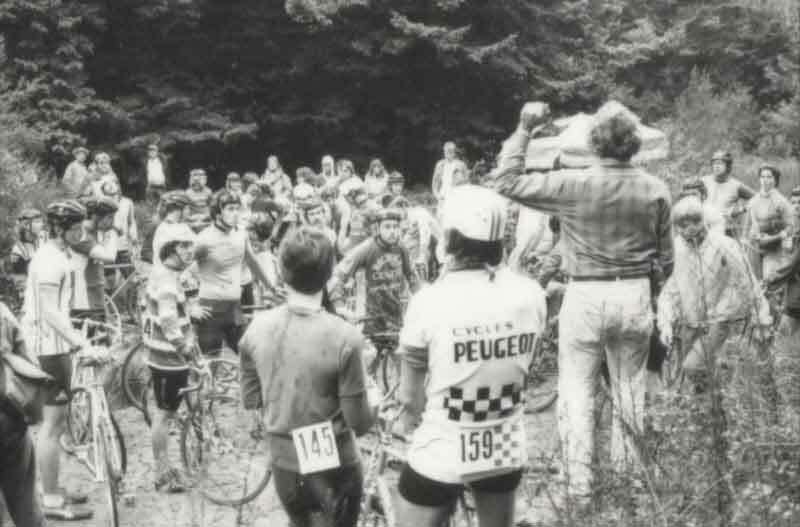 Cyclocross bicycle racing is more popular than ever and Santa Cruz, California has a long history in the sport, dating back to the late sixties/early seventies. 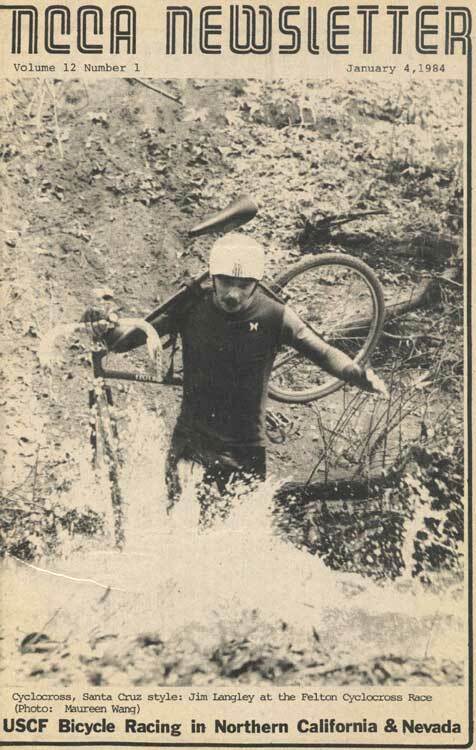 Tom Cuthbertson (click for photo; Tom wrote Anybody’s Bike Book), Dannie Nall (click for photo), a longtime road racer and bicycle mechanic, Charlie Dixon, another Surf City roadie, and Bob Liebold of VeloPromo started the first local series. 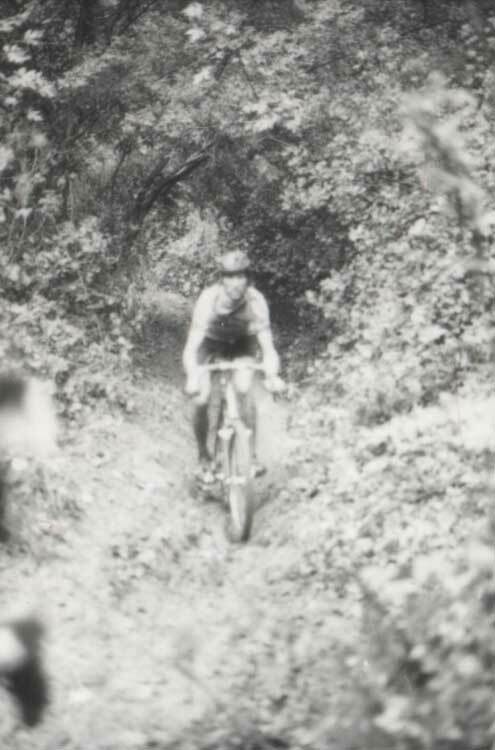 Tom and Dannie had been inspired by traveling to England to race cross. 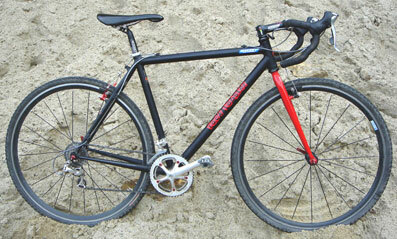 Tom rode a sweet-handling custom cross bike built in England for him by the legendary framesmiths at Hetchins. 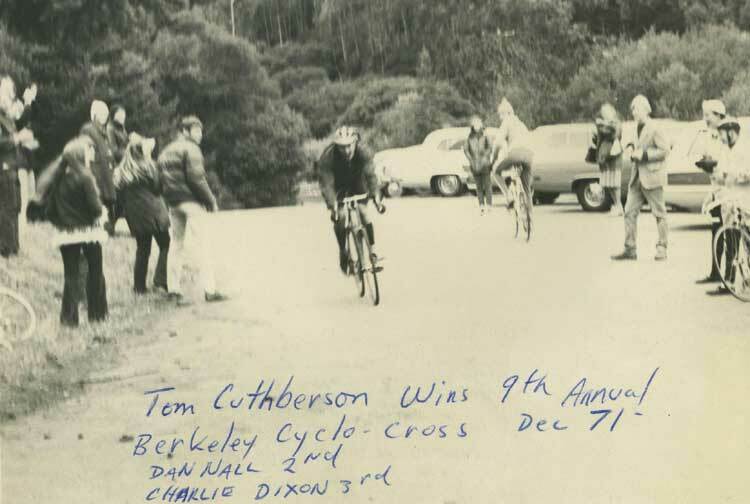 Tom, Dannie and Charlie were riding off road in the Santa Cruz Mountains on their cross bikes blazing the trails that are so renowned for mountain biking today. 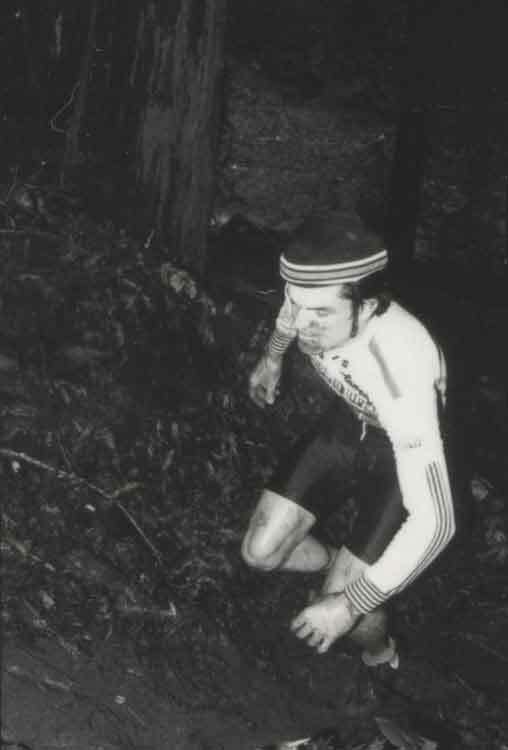 Tom was one of the best descenders I ever rode with. There was no way to hold his wheel. 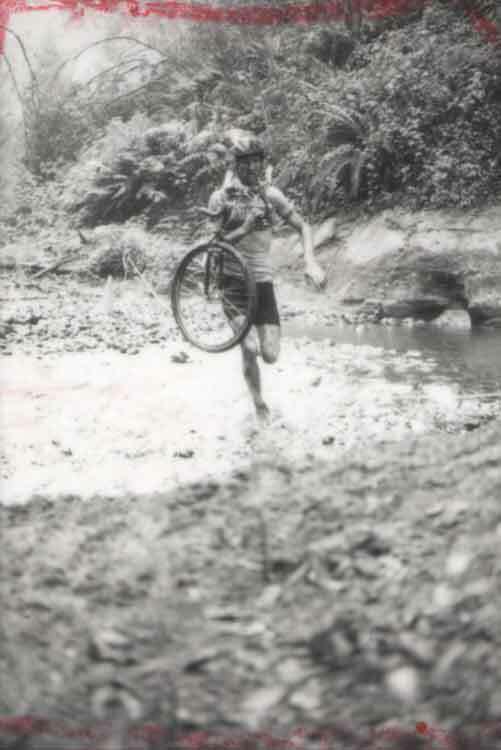 The legend is that he got that way by removing the brakes from his bike for training! 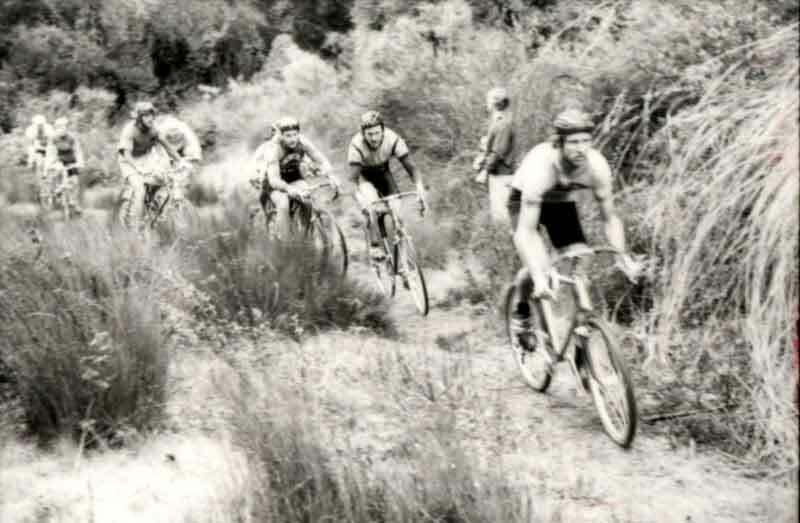 The Santa Monica Cycling Club cyclocross race in 1963 was one of the first. The racers included prominent riders, Olympians, serious cyclists. We just used our road bikes. It started in a park by a tennis court with a no bike-riding sign and went across the Bel-Air Country Club golf course and through a mansion’s garden. We actually scaled a chain-link fence. It was totally irreverent. The police were called and we all split before the awards ceremony. Needless to say my father expressed some doubts about my newfound sport and its participants. 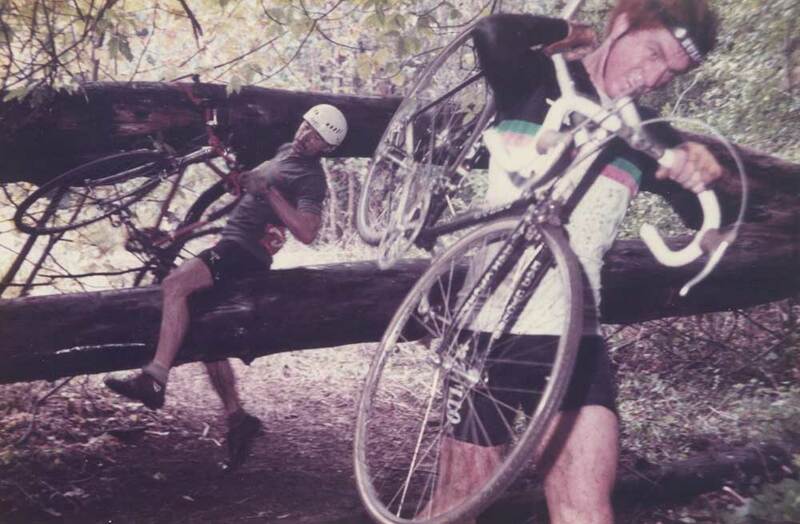 The Tilden Park cyclocross races in Berkeley became mecca until Tom Cuthbertson and I hit Santa Cruz. Tom won Tilden the first time we rode it. I was second. Then I won it year two and Charlie Dixon also won it. 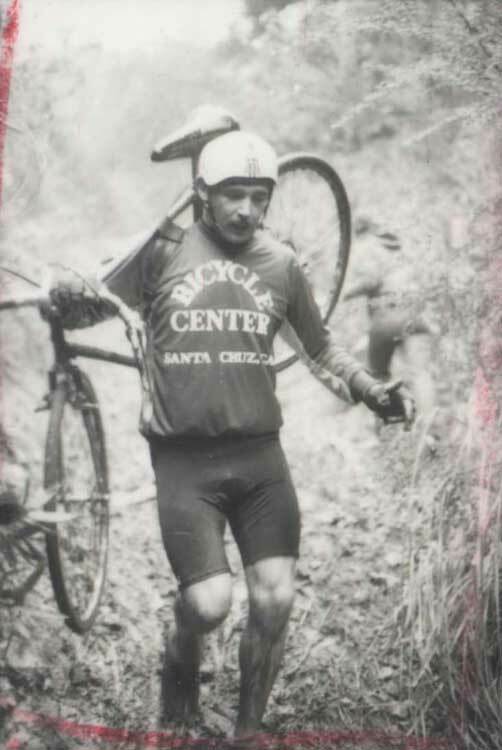 Bob Leibold, Tom, Charlie and I really pushed hard to make Santa Cruz the cross king. 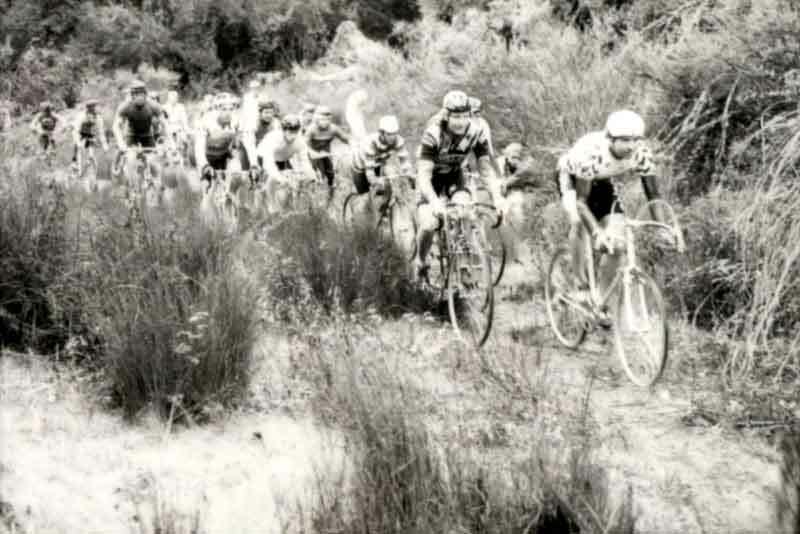 The first official Santa Cruz cyclocross was in 1970, probably at UCSC. In 1973 I was part of the first American team that went to the World Championships in London. We got lapped like everybody else. It was quite a test by fire. We showed up with what we thought was proper equipment. We got schooled. The Germans, who were the best amateurs in the world, taught me quite a bit. I wrote it all down, and started sharing it with people when we returned. Within a couple of years, our gear was much better. 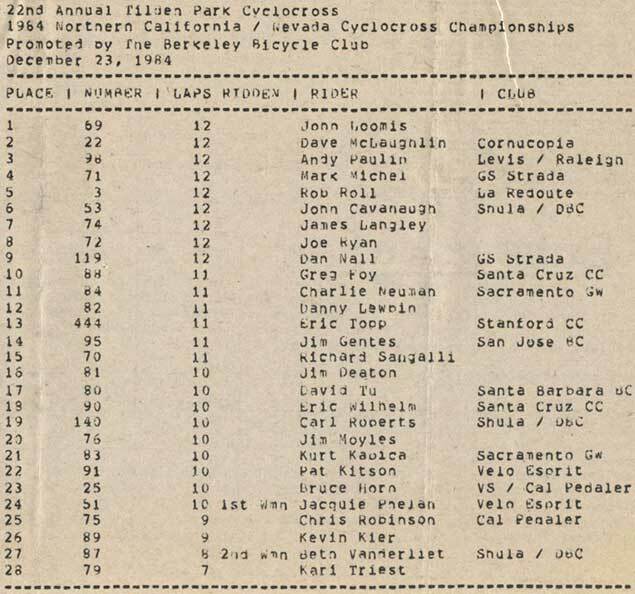 The best riders came from Northern Cal until Don Myrah’s run ended. The real credit goes to Bob for promoting the races. He should be in the Bicycle Hall of Fame! 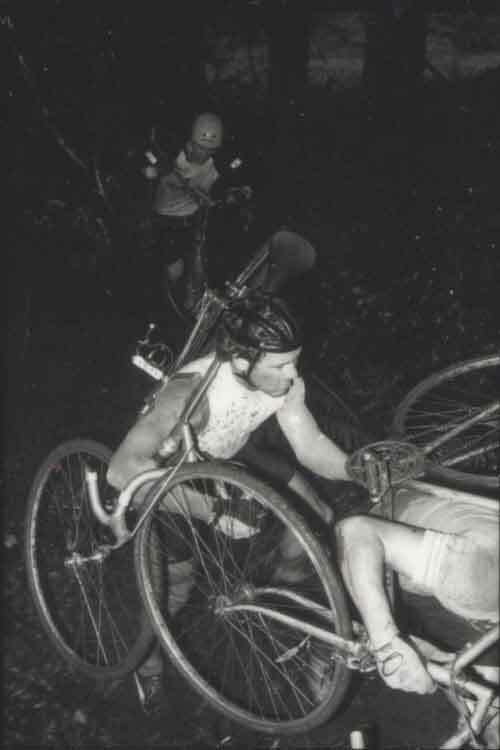 Later, Daryl Price from Santa Cruz was the Jr. National Champ and went on to be a top-five pro mountain bike racer. 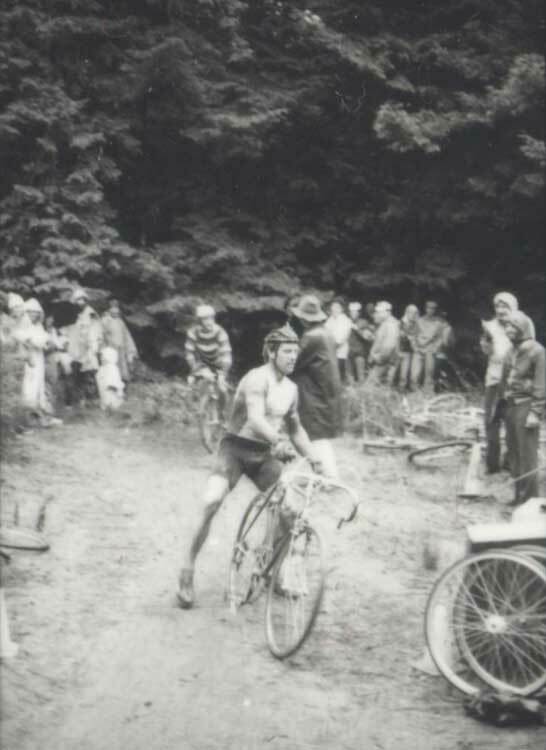 The first US Cross Championships were held in Berkeley, California’s Tilden Park in 1975 and were won by Laurence Malone who retained the crown until 1980 when Joe Ryan won. 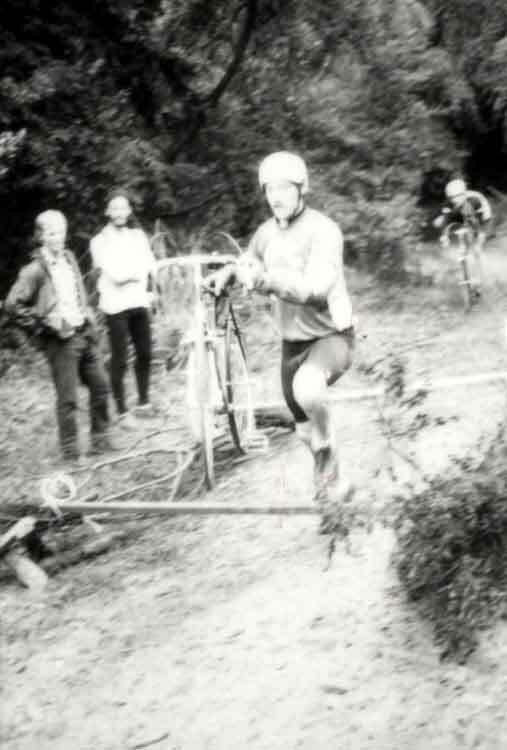 In 1977, Laurence had the best-yet American finish in the World Championships, and wowed the crowd by bunny-hopping the barriers, a stunt they hadn't seen before. They dubbed him the Flying American and the American Kangaroo. 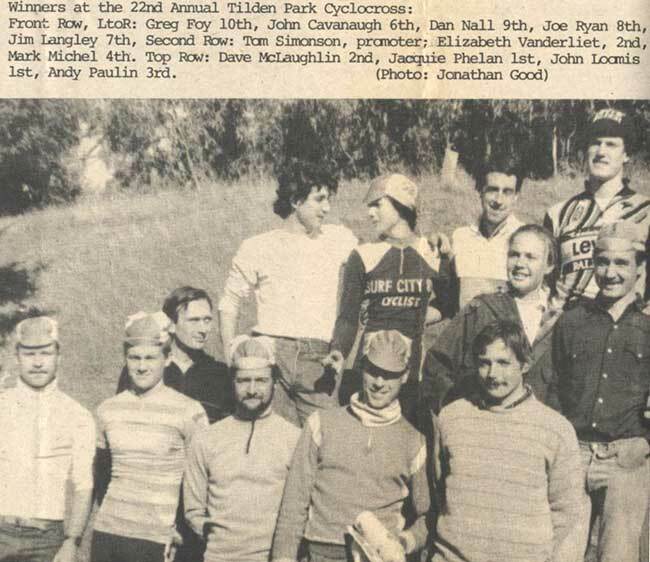 I came to Santa Cruz in 1980 and began racing in the Surf City Series in ’82, and continued each winter until 1984 when the National Cyclocross Championships were held at the University of California Santa Cruz (UCSC) campus on Sunday, December 30 — my last race. Zoom the two photos (above and below) taken just after the start to see Steve Tilford, Laurence Malone, Roy Knickman, Andy Paulin, Greg Foy, Mark Michel, Eric Wilhelm and about 57 others. Officials pulled all but 25 of us by race end (see results). 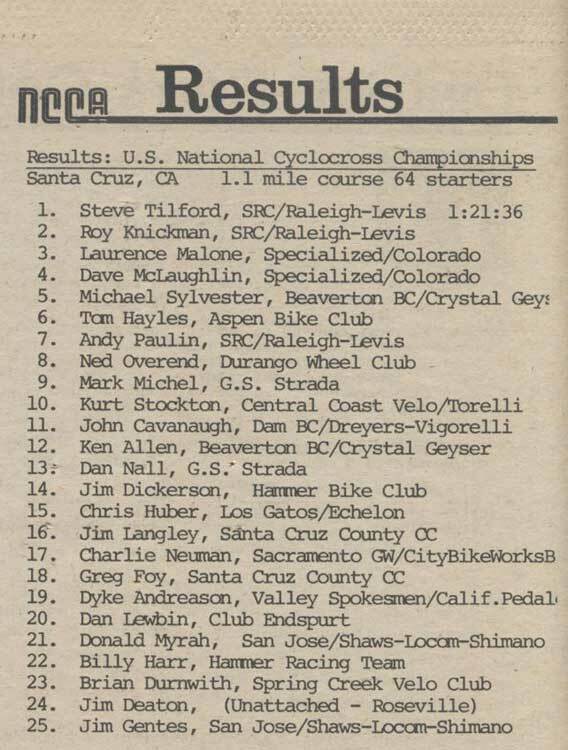 Tilford, the champ in 1983, won at UCSC too, lapping almost the entire field at least once. 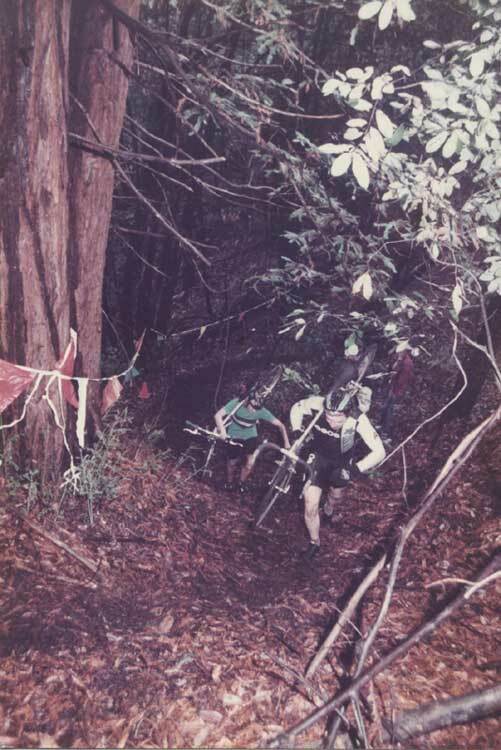 Cross races then were held at various county locations, including UCSC, in the Henry Cowell State Park forest (Rincon area), alongside Branciforte Creek and in Nisene Marks State Park. The average entry fee was $4. 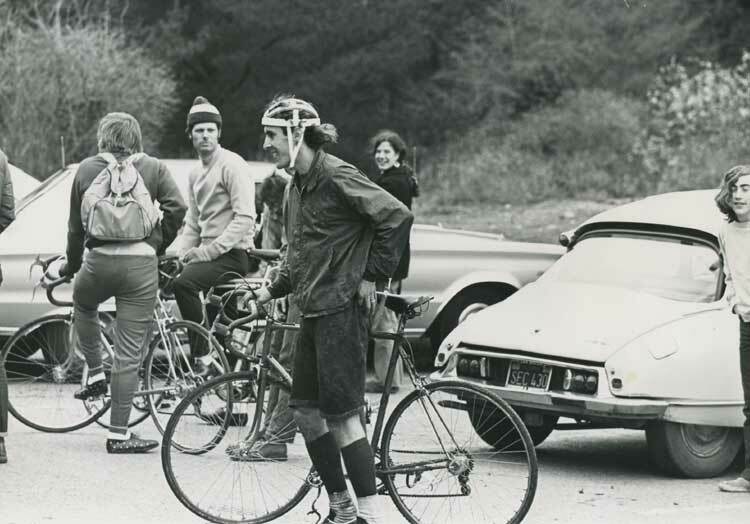 We would ride to and from the races for the ideal warm-up and cool-down. 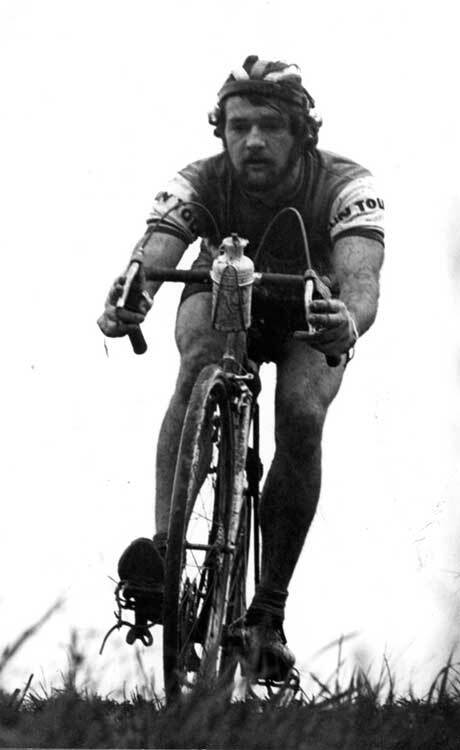 While this was well before the Lance Armstrong era, and I don’t recall Greg LeMond, who did race the road in NorCal, ever crossed it up, there is a possible Tour de France connection: I believe non other than current Versus Tour commentator Bob Roll was a top finisher at some of the Surf City cross races and placed 5th at the 1984 NorCal District Championships. Too bad he didn't make the photo. 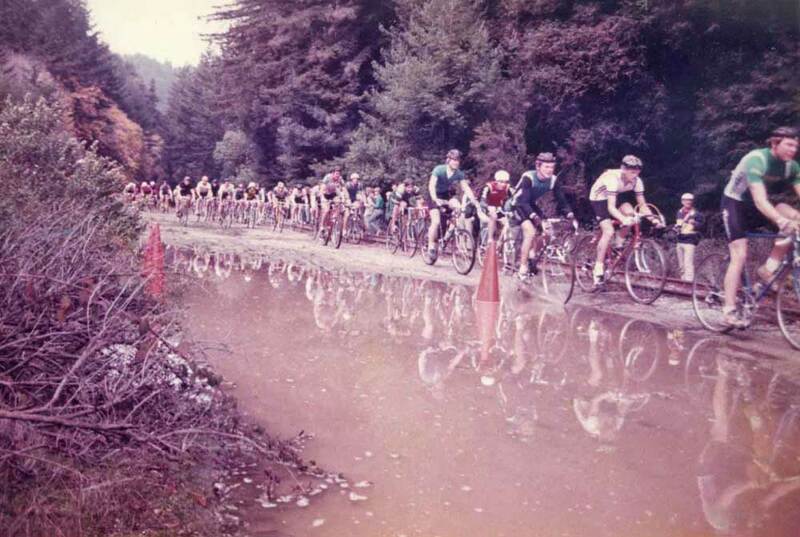 Heavy rains saturated the Bay Area during those winters and many of the cross races were classic mudfests. 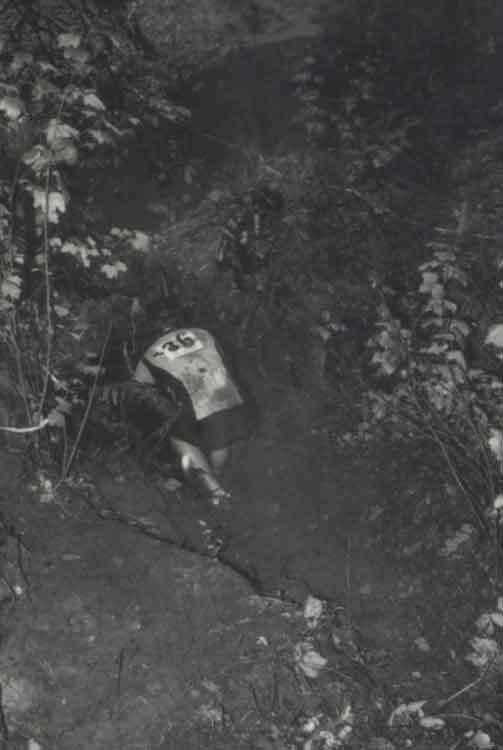 Instead of the manmade barriers used today, courses then were designed to force crossers over and through as many natural obstacles as possible, including creeks and rivers, huge downed redwood logs, mud pits, barbed wire fences and poison-oak covered trails. 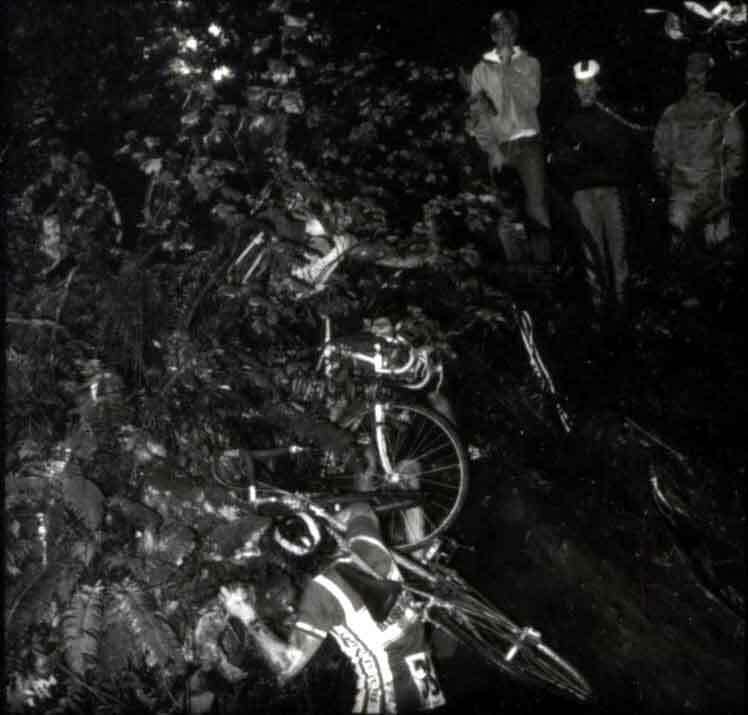 Flat tires, bent chainrings, broken chains, snapped seatposts and crashes were common. I remember a couple of juniors who tried to leap across a flood-level creek, fell in and got swept 100 yards downstream before they could scramble out and get back on course. 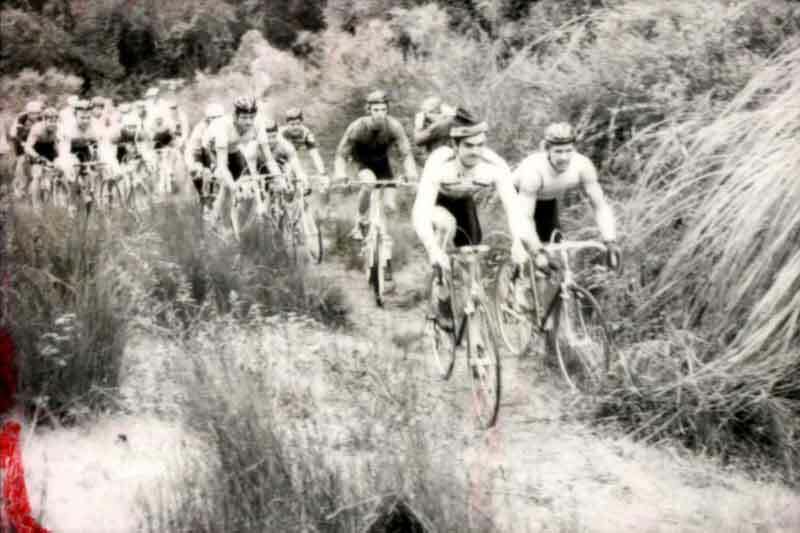 Besides carbon framesets and wheels that have significantly dropped the weight of today’s cross bikes and the more convenient and faster shifting-brake levers, like Shimano STI, the greatest technical difference back then was having to use pedals with toe clips and straps. This meant endless practice to learn how to quickly get in and out of the toe clips. The faster you were, the better you raced. And most of us never got very fast. 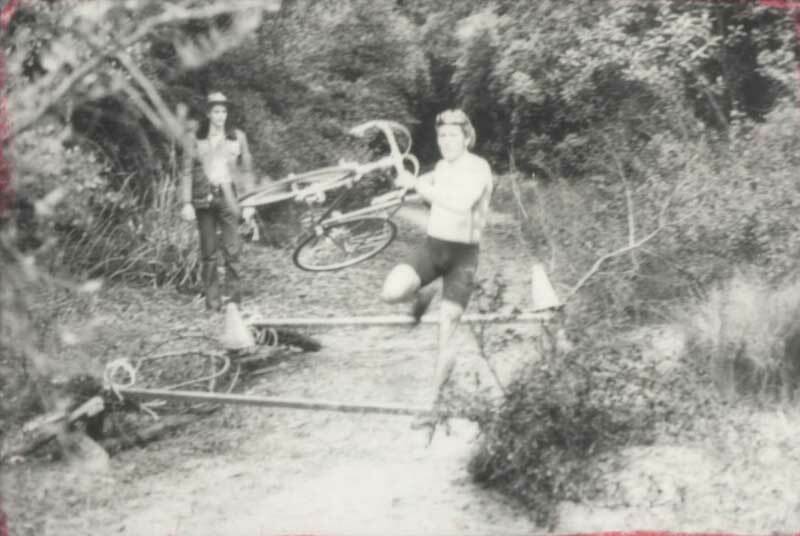 Also, when riding on the pedal bottoms, you had to use great care because the toe clips hung down and caught on roots, immediately stopping the bike and launching you over the bars. 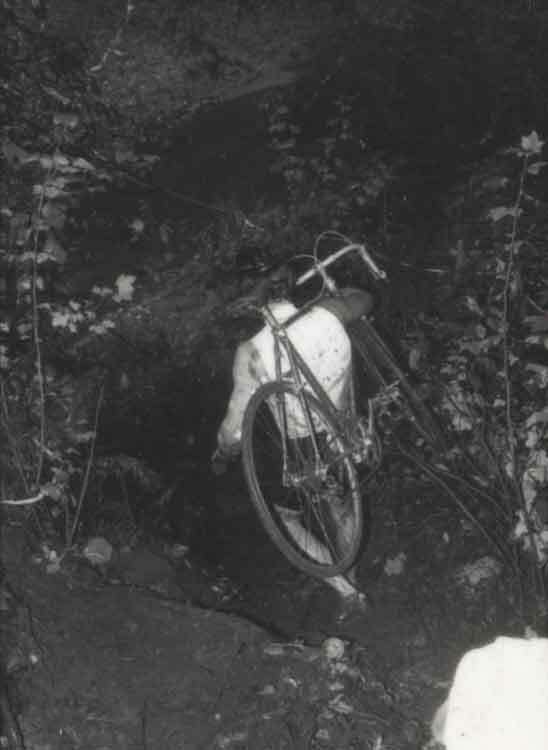 While you could ride a mountain bike (as long as the tires weren’t larger than 1.5 inch and there were no bar-ends), cross-worthy mountain-bike shoes weren’t available. So we modified soccer shoes, grinding off the front cleats and installing bicycle cleats — or if you had the money you could special order a pair of actual Rivat cross shoes from Europe. 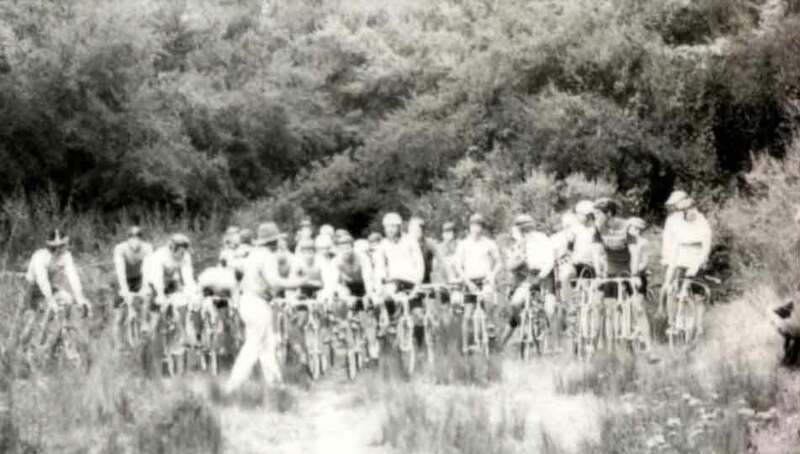 Laurence often rode a featherweight custom Cunningham Indian bicycle. It was handcrafted of oversize welded aluminum by Charlie Cunningham of Wilderness Trail Bikes fame. 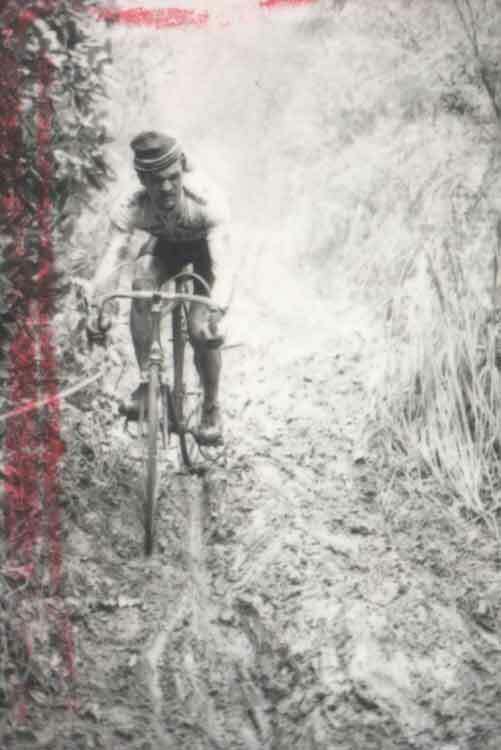 Besides allowing fatter tires for more traction in the slop, it featured technology ahead of its time such as a compact frame and an oversize seatpost similar to today’s seatmasts. Plus Charlie’s incredible Roller Cam cam-action brakes. Here are some more pictures given to me at the time by photographers covering the events. Please let me know of any mistakes. 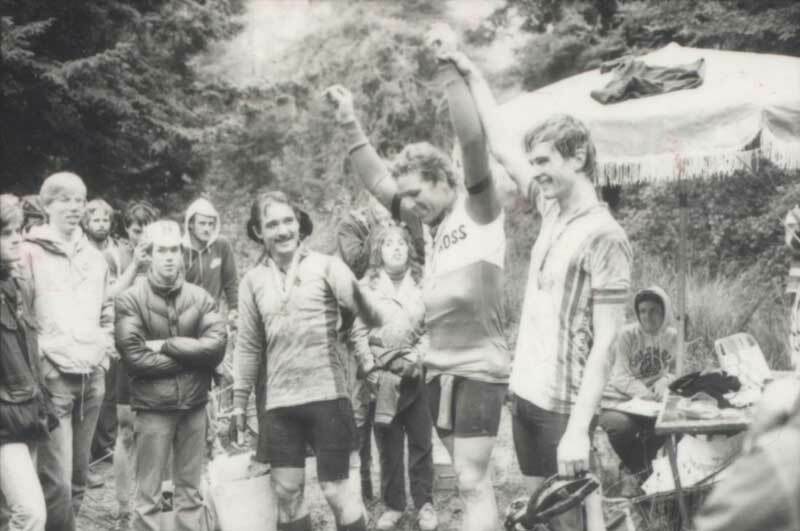 The black-and-white series below are from the 1983 NorCal District Championship held in Nisene Marks in and around Aptos Creek. 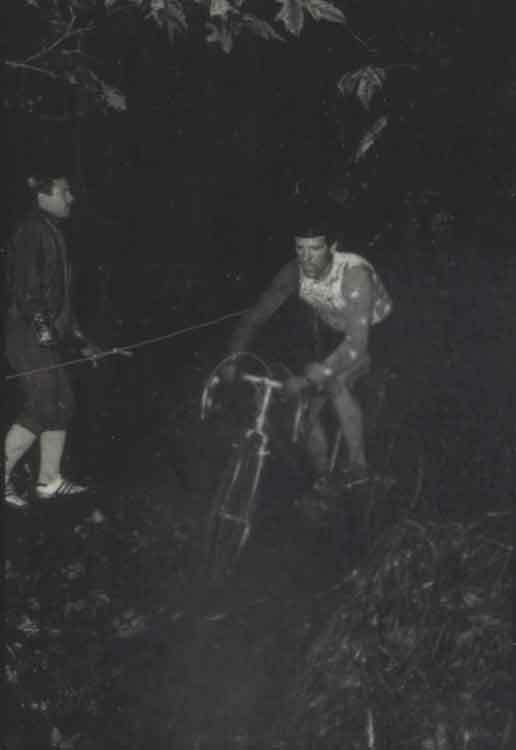 The race included a couple of former national champs, Clark Natwick and Laurence Malone. 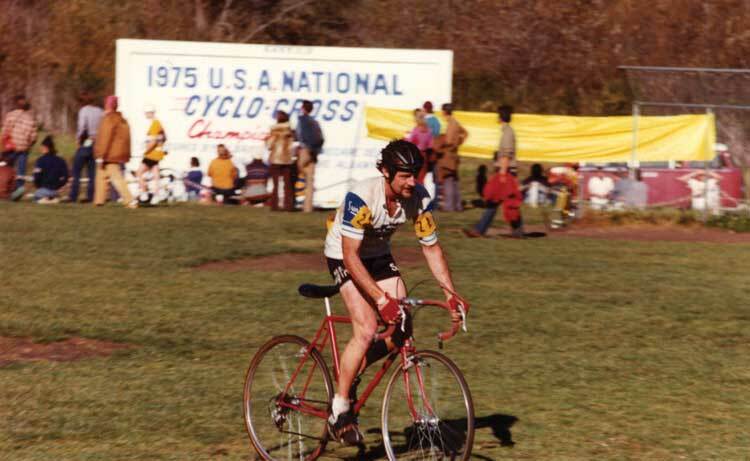 Clark won and then took his second and third national titles in 86 and 87. There’s a funny photo of a racer running without his bike. 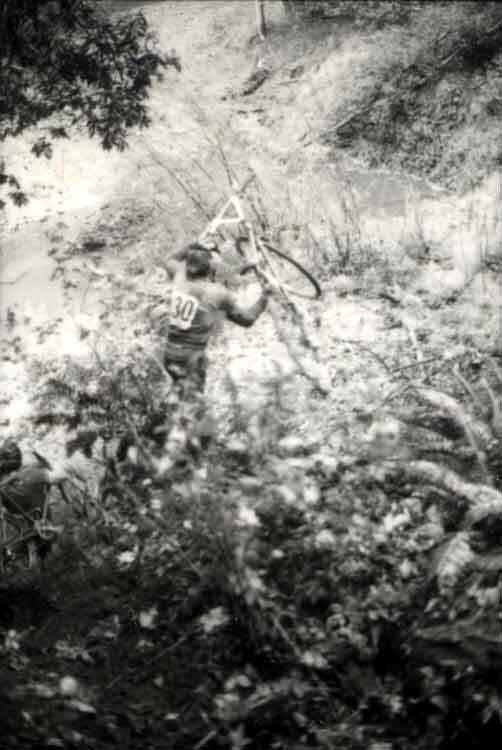 He had a friend catch one bike at the top of a tricky section and meet him on the other side with his backup bike so that he could gain an advantage. He was disqualified, but we all got a kick out of him trying it. The run-up . 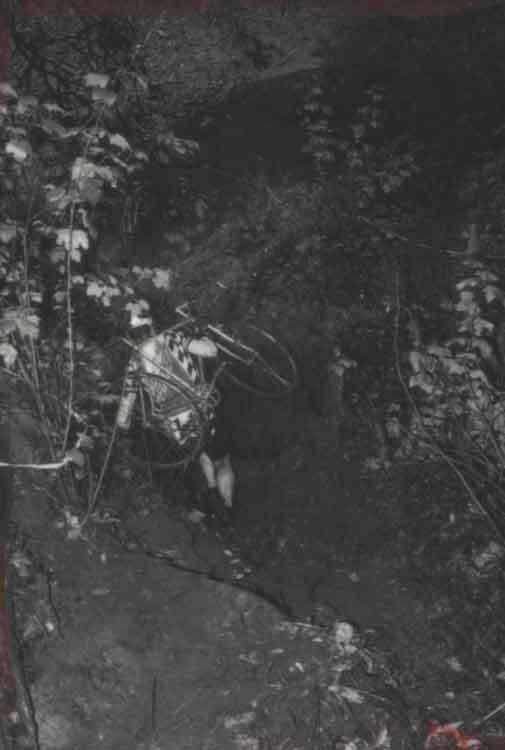 . . where’s his bike?